Last week we took a trip to Detroit. Detroit is about two hours from home, about the same distance as Toronto, but in the opposite direction. When we travel we usually fly from the Detroit airport and we've been to restaurants downtown and shopping in the suburbs plenty of times, but this was our first time staying overnight downtown and walking around the city. We were there to see Jack White in concert at the Masonic Temple theatre, so we decided to spend about 24-hours in Detroit for the concert. I have to admit, we were a little nervous at first. People seem to think Detroit's not safe. I'd read online that it is perfectly safe to walk around the downtown area, but we'd never done it and didn't know our way around. Of course, when planning where to eat and drink, I looked for places with a great craft beer selection, and there were plenty! Our first stop was just outside downtown where Atwater brewery has converted a church into a new brewery. They have a beautiful outdoor beer garden but it was rainy so we headed inside. Old churches are just the perfect place for breweries. We sat at the bar and enjoyed the local beer and cider, and ordered a late lunch. I had chicken schnitzel with cucumber salad and a latke and it was fantastic. Matt had sausage and pierogies so he was very happy. Although our GPS directed us to get back on the highway, the sun had come out and we decided to take Jefferson Ave downtown, and we were glad we did. We drove past so many beautiful buildings. Before we got to our hotel, we stopped for some drinks and snacks for the room. We enjoyed this local beer and cider while we got ready for our night out. 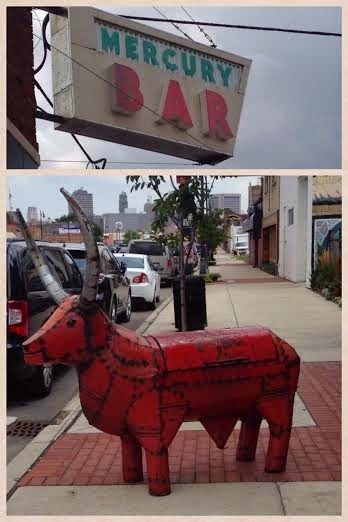 Our first stop was Grand Trunk Pub, an easy walk from our hotel near Greektown. Like many places in Detroit, the building is steeped in history. It used to be a railway station and the beautiful ceilings and other features remain from way back then. Now they have a fantastic local craft beer selection. I tried the B. Nektar Zombie Killer, a cider and mead blend and it was delicious. Matt tried several Michigan beers. We also had some cheap cocktails and food for happy hour. We walked along to our next stop, admiring the beautiful buildings. I love the colourful windows on this one. Our next stop was an amazing, historical treasure. My pictures don't do it justice so I encourage you to check it out online. Cliff Bell's is a gorgeous art deco bar from the 1930s that has been beautifully restored. The ceiling is particularly striking and made of curved wood. The bar has little tables at regular intervals so those sitting at the bar can also face their companion. I had my first ever Negroni here (gin, vermouth and campari) and it won't be my last. The bar has live music nightly and a fantastic atmosphere. Highly recommended! We made our way to the beautiful Masonic Temple theatre for the concert. Jack White put on a tremendous show for the hometown crowd. He actually contributed money to keep the theatre open when it was in foreclosure because his mother had worked as an usher there. The next day we headed to Corktown for coffee and an early lunch. This is the the oldest neighbourhood in Detroit and was originally an Irish enclave. Now it's hipster central with great restaurants and bars. 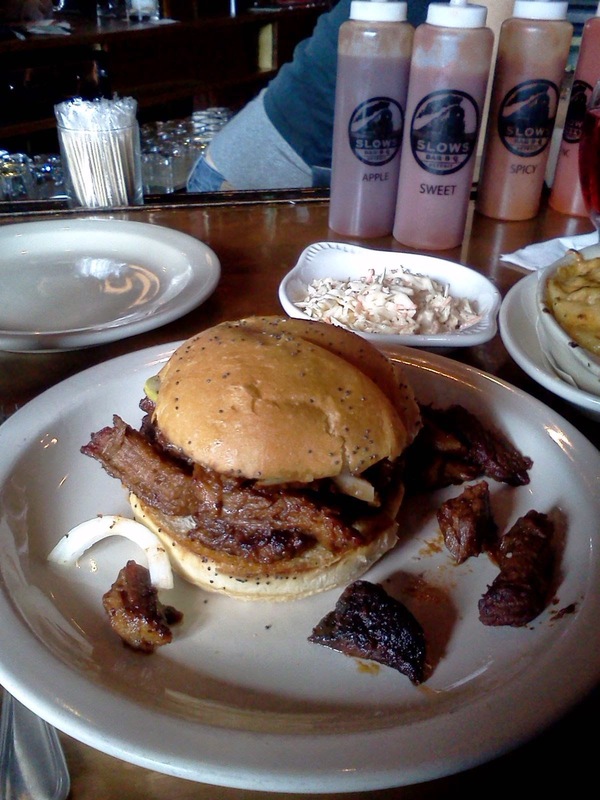 We've eaten at Slow's BarBQ plenty of times and love their amazing sandwiches and great beer selection. ... but the burgers were worth it! Both Matt and I thought these may have been the best burgers we'd ever had. I had the French Onion burger with bacon, carmelized onions, Gruyere cheese and fried onion strings. I'm not always the biggest fan of bacon on a burger - it just seems like overkill, but this combo was perfect! Matt had the Southwest Detroit burger with chorizo, jalapenos, muenster cheese, avocado, tortilla crisps and spiced pickled carrots. He loved this burger! Instead of fries, he got chili cheese tater tots on the side, which is just insane. Sadly, it was time to head home after lunch, but we will be back soon! We had a fantastic time. Detroit has so much to offer and we just scratched the surface. Everyone we met was friendly and helpful and we felt safe and welcome the entire time.